Capital and Jet2holidays have teamed up to bring you the chance to win an amazing 5* holiday to Antalya, Turkey. Jet2holidays delivers amazing deals on package holidays you can trust. Scroll down to check out the awesome destination that you could be visiting! Jet2holidays brings you the full package, with all holidays including flights, hotels, transfers and rep service, all ATOL and ABTA protected. Jet2holidays covers all the extra touches that make sure you have the holiday of a lifetime. With low deposits of just £60pp, friendly flight times, a dedicated groups service and a 22kg baggage allowance, it's no wonder that they've won awards like the Which? Travel Brand Of The Year. They also fly direct from London Stansted to 42 amazing destinations. 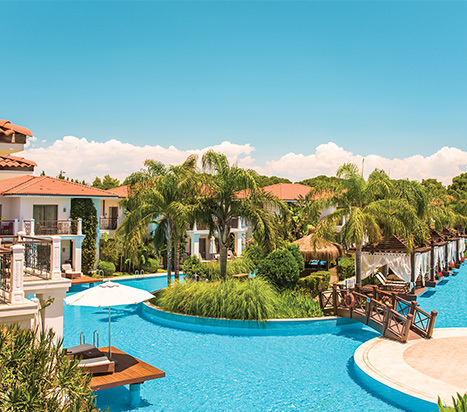 You could win a seven-night all inclusive holiday for two at the 5* Ela Quality Resort, Antalya with Jet2holidays. Prepare to be immersed in a tropical paradise that presents pure luxury at every turn. There’s a palatial splendour to the interiors, and bedrooms welcome you with luxuries like sumptuous beds and poolside piers. Meander between the bougainvillea-wrapped balconies and palms swaying in the gardens.